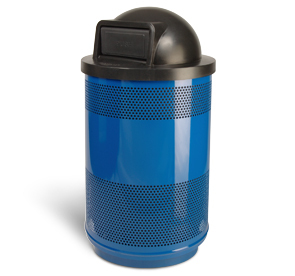 High-quality trash can may be used in almost any location. 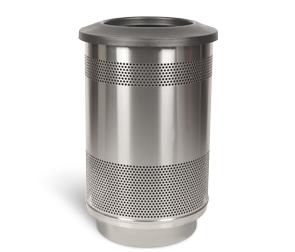 Made of heavy gauge solid and perforated steel, this trash can is designed to be used indoors or outdoors. 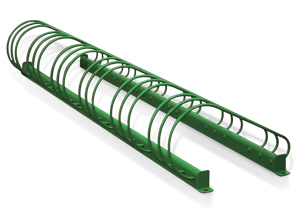 Lift off top makes servicing easy. Top lid options include flat top, hood top and dome top. 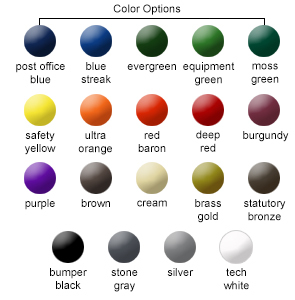 Available in powder-coat finish color options shown below and stainless steel. The difference between the two 55 gallon models is a recessed base that is 5" higher on the taller model, please refer to the dimensions below. Both of the 55 gallon receptacles come standard with leveling feet. Standard on 35 gallon and 55 gallon models, the receptacle base is dipped in corrosion resistant plastisol for added durability and will match your chosen receptacle color. Plastisol Dipped Base comes standard on 35 gallon and above models.